Oh my goodness you guys, Rusty dreams of dinosaurs! (I sneer at your pedantic “pterosaurs aren’t technically dinosaurs” gripe, Rusty and Mark were talking about dinosaurs all week and you know we’re going to get some.) While this will provide lots of opportunities for awesome dinosaur drawings, it also provides Mark with an opportunity to abandon his hideous ward in the woods, as you’ll note that Rusty has just dozed off on the ground without Mark being anywhere nearby. Looks like that fishing trip was just a last hurrah, or, more likely, an excuse to take Rusty so far away from home that he’ll never find his way back! Dang, Snuffy’s reputation precedes him … his reputation as a man who steals chickens so he can dismember and eat them. Ha ha, it’s funny that the chickens are afraid of Snuffy, because they don’t want to die! 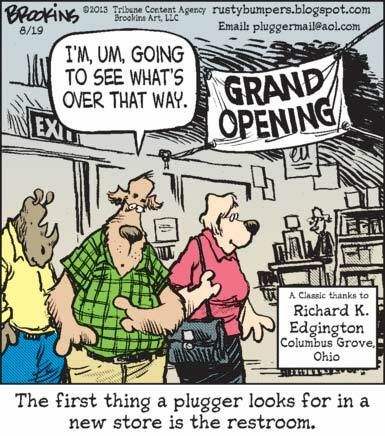 Pluggers just have to poop all the time.